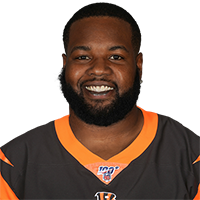 Published: Nov. 5, 2017 at 02:11 p.m.
Cincinnati Bengals running back Joe Mixon runs in a 7-yard touchdown. Published: Oct. 1, 2012 at 04:10 a.m.
(12:31) A.Dalton pass short right intended for C.Pressley INTERCEPTED by K.Bosworth at CIN 23. K.Bosworth to CIN 13 for 10 yards. FUMBLES, RECOVERED by CIN-A.Smith at CIN 9. A.Smith to CIN 9 for no gain (K.Bosworth). Published: Sept. 30, 2012 at 04:27 p.m.
Andy Dalton throws an interception to Jacksonville Jaguars linebacker Kyle Bosworth who fumbles it back to the Cincinnati Bengals.